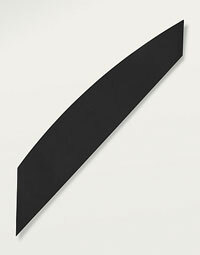 Happy Belated Birthday to Ellsworth Kelly! To celebrate for Ellsworth Kelly's 90th Birthday (May 31st, 2013) and his artistic genius, I visited two institutions in Philadelphia who are exhibiting his work. The Philadelphia Museum of Art and the Barnes Foundation both have exhibitions highlighting two contrasting sectors of the artist's work. The Barnes' show, "Ellsworth Kelly: Sculpture on the Wall" (open until September 2nd, 2013), really appeals me due to the each sculpture's monumental size and brilliant color. Moreover, the PMA has a tasteful exhibition, "Homage to Ellsworth Kelly" (open until August 25th,2013), which primarily highlights four of Kelly's paintings: Red Yellow Blue White (1952), Diagonal with Curve III(1978), Black Red-Orange (1966), and Yellow Relief with White (1990).